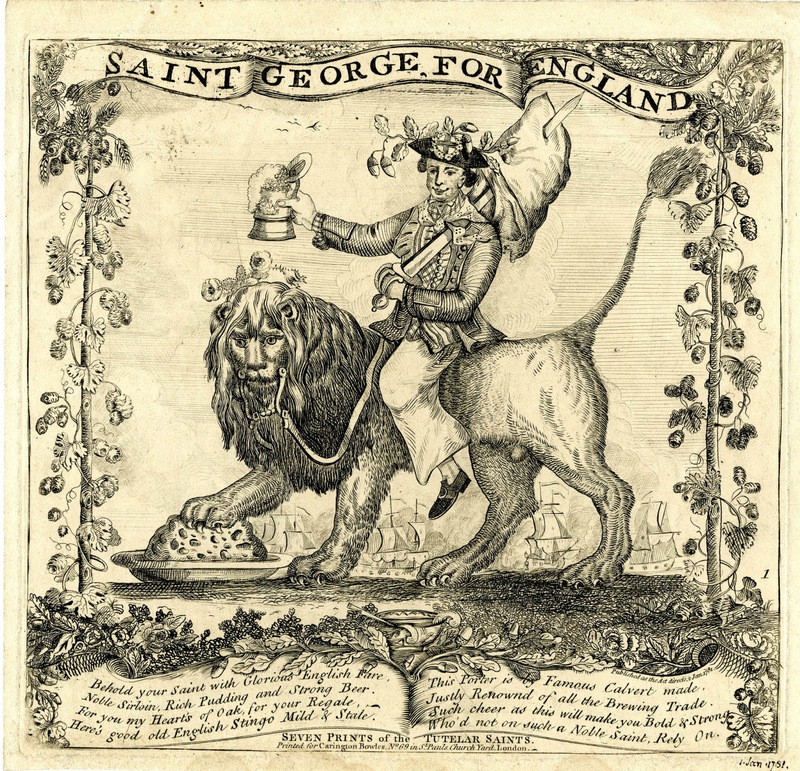 Saint George for England, Carrington Bowles, 1781, British Museum. Noble Sirloin, Rich Pudding and strong Beer. Here 's good old English Stingo Mild & Stale. Justly Renowned of all the Brewing Trade. Who'd not on such a Noble Saint, Rely on. Lifting his foaming tankard with a smile, our jolly tar is Saint George himself, patron of England. He is the first in a series of seven "Tutelar Saints" (meaning guardian saints) produced by Bowles. Each represents a different nation, riding a different mount, and carrying a different indulgence. Patrick on a horse with wine for Ireland, Andrew on a unicorn with snuff for Scotland, and David on a goat with leeks. The remaining three are for Spain, France, and Italy, but I have not yet found the images nor the saints connected with those. 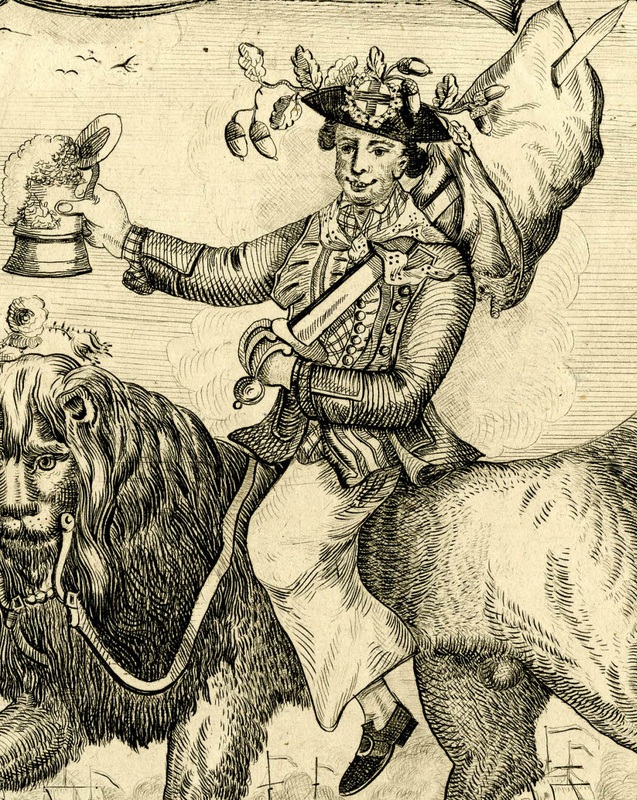 I have often pointed out on this blog that the British nation was increasingly personified in the image of a common sailor as the eighteenth century progressed. Here we see that trend at its logical conclusion. Saint George is no longer a knight on horseback lancing a dragon, but is a sailor with a comically oversized sword driven through the white flag of France and raising a good Calvert & Co. porter to his victory. 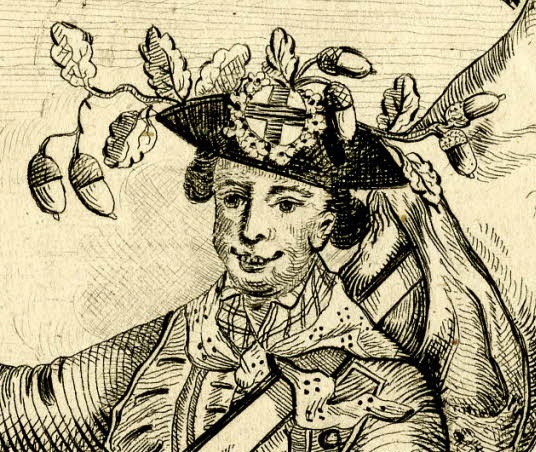 His reversed cocked hat is festooned with a large badge bearing the cross of Saint George, and topped with acorns. Beneath it he wears a bob wig. George's dotted neckcloth is draped over his checked shirt, jacket, and sword. Bowles couldn't decide on which pattern to make George's single breasted waistcoat, so he alternates between plaid, horizontally striped, and vertically striped. His jacket is piped in a plain tape, around the cuffs, lapels, and pocket. George's trousers end above the ankle and are remarkably wide bottomed. Plain stockings run into shoes with oval buckles. The waistcoat is vertically striped as is evident on the figure's right (viewer's left) above the sword and, of course, the skirt. What appears to be a plaid is, I believe, the sailor's ubiquitous check shirt (see the exposed shirt sleeve and cuff for comparison). What appears to be a horizontal stripe is, I believe, lace or tape extending out from the waistcoat buttons. A great print! Thanks for posting. Another great post and a great link to Ron's articles. Thank you for both.